Martin Dougiamas gave the keynote today “Back to the classroom” at the 1st Moodle Research Conference in Crete. This is an attempted summary. Martin set out that his goal was to try to set the tone and give us something to think about over the next couple of days while we listened to the research papers. Firstly, he contemplated on his presentation title – “Back to the Classroom”. If you stand with your back to the classroom you are looking at the board (which is not a comment on Blackboard) – but this is often turning our backs on the classroom focusing on the technology which some do. The other meaning is that it is returning to the classroom to learn, and for Martin this means going back to the community and learning from the community and those at the research conference. As there is such a diversity of skills at the conference that it is a great networking opportunity. Martin posed the question “Why are we here?” and then he took this point further as to why did the audience choose to work in the education field rather than another field? He would guess that most are here because they believe education is so very important. Martin next posed two more questions “why is education important?” and “Why do we need to improve education?”. Various people contributed that things are changing, and that we are learning more about how we learn, how we teach. Martin sees us as a machine of humanity. There are problems and inefficiencies and so Martin as an engineer wants to waste less, do things better and make things faster and achieve more things. In short, he wants to be “hacking on the machine of humanity”. Martin brought us back to his PhD before Moodle, where he was exploring Moodle as a way to tackle inefficiencies that he saw going on at the time. He had five design references which he used as points to refer to as decisions were made about the complex area of learning management systems. All of us are potential teachers as well as learners – So in a collaborative environment you need to give both opportunities to all people involved. See http://docs.moodle.org/23/en/Pedagogy for more details on this. The flexibility is more important as computers are more pervasive and are more part of us, so the learning situation needs to change as the environment happens. He asked if people used the survey tool in Moodle (one of the first analytics in Moodle) – 3 people put their hands up which would certainly be similar to my experience, as most like the flexibility of Feedback module or the Questionnaire module which allow customised surveys. He talked about the progression and that only some teachers get beyond level 3 – Most people are just stuck at the bottom, and most of the new MOOCs are also stuck there delivering content, and assessment rather than moving further up the points. He pondered as to why people are stuck there. He then proposed that it is because so few people have been through a course which is highly collaborative, and so are not familiar with it from teacher or student point of view. Martin also suggested that perhaps training and documentation are not as strong in this area. He lastly recognised that perhaps collaboration is not needed in all learning contexts so there is just no need for that level. “The power of the tool leads you through certain processes – they can be much better than they are now”. Martin then paused and gave an overview of what Moodle is. And then the other things like Repositories, conferencing systems are outside of Moodle – That way an institution can customise the whole system as they need for their needs. What kind of enhancements of improvements can be plugins? What changes need to be made to Moodle core? Martin said that plugins are like Apps on phones, which are easier for developers and easier for users particularly since Moodle 2. The community plugins directory has over 30 different types of plugins available, with hundreds in the directory. In Moodle 2.3 the Moodle site can check if a plugin needs to be updated by checking centrally when there is a new version so you can download and upgrade them. In Moodle 2.4 this will be taken further (a bit like WordPress) which there the admin will be able to press a button to update the plugins. In Jan 2012, all the developers in Moodle HQ spent all their time working on the development documentation to aid developers write plugins. So this is a good reference now. Only in the last few weeks, the plugins are now part of the normal Moodle translation system so it will be easier to maintain multiple languages for each plugin. Martin explained how the Core development works, with contributors, management, dev team, stable team, test team, integration team and then at the end Moodle core. 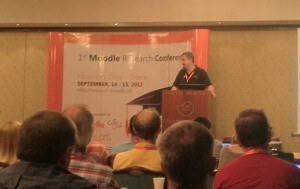 Martin believes that Moodle is the best platform for researchers to be working on since it is open source and so many are using it, and therefore a good opportunity to see it in use. However it is difficult to generalise that one institutions code developments may be specific to their culture and needs and Moodle HQ has to ensure things work on all platforms, all databases and all cultures. Martin believes some ideas are just not compatible with Moodle, although Moodle can evolve but it is what it is. 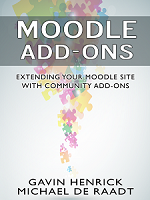 This can be seen in some people still being on 1.9 as Moodle 2 is quite different in some areas. Martin does not want this to happen again so will focus on smooth growth and stability as the most crucial areas to work on now. Martin proposes that at some point you need to make a break and fork off and do something different. In October 40 developers (All HQ + 20 others) are heading to Perth to brainstorm future technical developments and try to decide on architecture changes, working on code together for 5 days. What changes or functionalities should be a new platform? Martin took some questions from the floor, and there were some great questions from the audience about Moodle evolution. Martin did add an interesting point that he has been running a “MOOC” for years, as the Moodle.org community is an open course on how to use Moodle. Thanks for this thorough summary Gavin; I am reading with interest your tweets (from a rainy Preston) and feeling very envious! Thanks Gavin. It was interesting to read your summary of Martin’s keynote and a nice thought to muse on – all those Moodle brains gathered in Crete! I really like to put the social constructivist theory into action in my Moodle courses. Collaborative activities such as forums and databases are working really well in my current course. I find the COLLES preferred survey very useful and found the questions covered just what I needed. Recently trialled a feedback activity as different way of sharing course related individual ideas anonymously. I’m planning to using Workshop for a number of assessed tasks very soon. I’m waiting till we upgrade from 1.9 to 2.3. Looking forward to that! Thanks again Gavin. I enjoy exploring your site. Thanks for this useful summary. I’d be interested to read or view Martin’s whole keynote – do you know if it was recorded? Thanks! nice objective for me :-). Yes I’m wondering about any recordings too. I believe they intend to make the recordings public – will post an update when I see them.